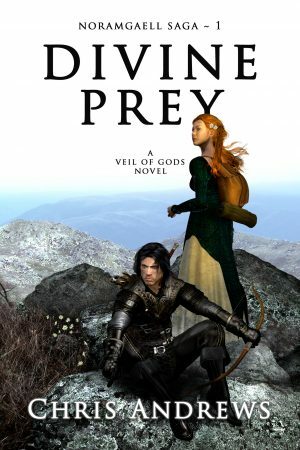 Divine Prey is a new epic fantasy series filled with action, adventure, hope and magic. It's perfect for fans of Raymond E Feist, Anne McCaffrey, J. K. Rowling, Rick Riordan, and more. For thousands of years the Gods have been fighting to outwit each other in the ultimate war for supremacy. Only two Gods remain in the contest; the God of War and the Goddess of Healing. The stakes are high. The prize is the universe itself. The winner will be decided by pitting two empires against each other, each led by a single Champion. The gamble sets an immortal warlord with vast armies against an untried young princess... and an empire she is destined to create. Called to Divine Service by the Goddess of Healing, Princess Caroline defies the offer in the mistaken belief she is being punished, and in doing marks she herself as a target for the other Gods. Spoiled and entitled, her defiance sees the God of War's hunters seeking her death before she can even begin her destiny. Worse, Caroline's Gods-granted destiny comes with a heavy price - she cannot ascend the throne unless her father and siblings are dead. As the Gods play their games and the stakes rise, Caroline is forced to rely on the trust she places in her friends, and the curse that's slowly destroying her humanity. She doesn't yet realise the final battle has already began and she's not just fighting for a world, but herself and everyone she cares about. To succeed, she will have to outwit her family, her enemies and even the Gods.